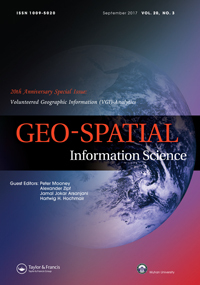 The Special Issue: Volunteered Geographic Information (VGI) - Analytics ( Vol 20, Issue 3) has been published by Taylor & Francis in the Open Access Journal Geo-Spatial Information Science (GSIS) - celebrating the journal`s 20th anniversary. GSIS is now indexed in the Emerging Sources Citation Index. We also want to make you aware of the new Call for Papers for the Special Issue on “Crowdsouring for Urban Geoinformatics“. Deadline End of November 2017! (SI editors: H. Fan, P. de Alberquerque, B. Resch, R. Westerholt, A. Zipf). We are looking forward to your Open Access contribution WITHOUT COST for authors!